It’s Christmas Day Eve 2009 and I just finished riding my last horse of the short work day. It was a day much unlike the last – the sun was bright, no wind, seasonal but tolerable temperatures. I was able to work each horse in the outdoor arena, followed by a hack on the vineyard trails. I just kept thinking: life doesn’t get much better than this! During my time with my horses, for some reason, I recounted many of my childhood memories, some of which I haven’t thought of since I was 8 or 9 years old. The first that came to mind was how every Christmas Eve day, I spent the entire day at the barn with my horses. Because I thought they understood what Christmas was, I did everything I possibly could to make it special for them. Grooming, special treats, extra everything just for that one day. And, of course, I always asked Santa for some piece of tack that I lacked and, every year, I was fortunate to find that something special under the tree. I could hardly wait to return the next day to give it a try. I know my horses always felt it was their gift, not mine. In those quiet days in the barn, I remember listening to the horses chewing their hay and how good they made it sound. When feeding their grain, I would pick out a few pieces of the pounded corn covered in molasses to eat and share a meal with my favorite friends. At 8 years old, I thought this was the true meaning of Peace on Earth. This memory then sparked a recollection of my 9th Christmas Day. It was late morning and the family of early risers had already opened presents and feasted on a bountiful breakfast when the doorbell rang. Being the youngest, I was sent to answer it. When I opened the door, I was greeted by a large bale of straw adorned with a red ribbon the size of my head! Nothing else accompanied the straw, besides my family standing behind me watching my next move. I turned to look at them and it was then I was told that a very special horse that I had been riding and caring for would now belong to me. I went crazy and wanted to leave that very moment to give my newest horse the news! 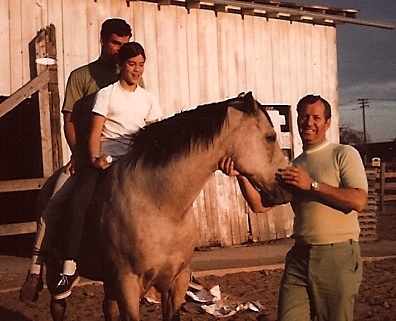 A couple of hours passed, which felt like an eternity, and my father conceded and took me to see “Dallas,” MY 16.2hh buckskin gelding. I do remember the joy and excitement I felt when I broke the news to my boy. I was certain he understood me perfectly. I had been here the day before thinking that life doesn’t get any better and then it just did! The story behind Dallas goes something like this: Our family friends and neighbors owned a large business in Portland, Oregon, and as a gimmick to draw in customers, they purchased a very famous horse from the Hollywood movie studios. Lucky us, we got to keep him at our barn and for one week Dallas would travel daily to the store and allow people to pet him and see him in person. Dallas’ claim to fame was allowing James Arnes from the show “Gunsmoke” and Loren Greene of “Bonanza” to ride him as their mount.